A liability waiver is a necessary document to sign before one participates in any activity. Activities can be a program, a course, works related to construction, projects, servicing and everything else. It protects the participants from any liabilities that can be both legal and monetary that may arise from his actions. Such document lists all sort of risks that may emerge in the work fields and the risks that the participants will not be responsible for. You can also see the Sample Medical Waiver Forms. 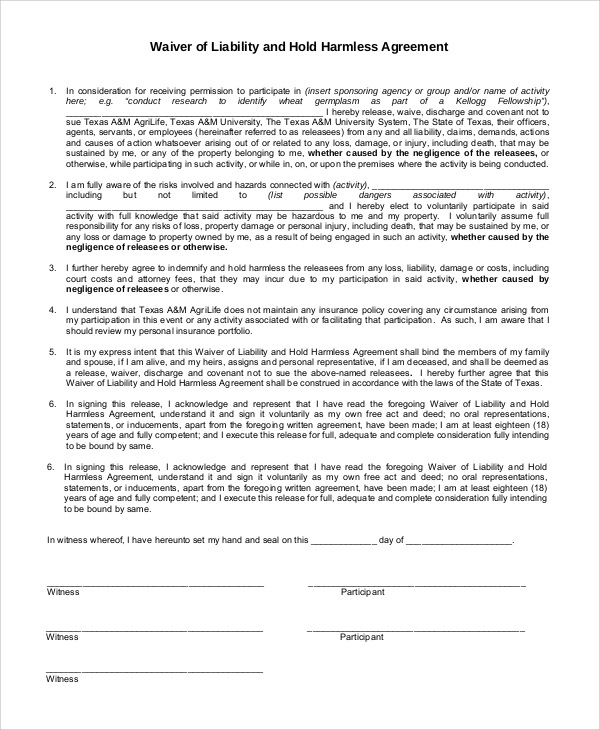 This is a perfect form for waiver of liability and hold harmless agreement. It is signed by the participants of any program or contract, and it makes sure that he will not be liable for anything including legal affairs that may arise due to his activities. 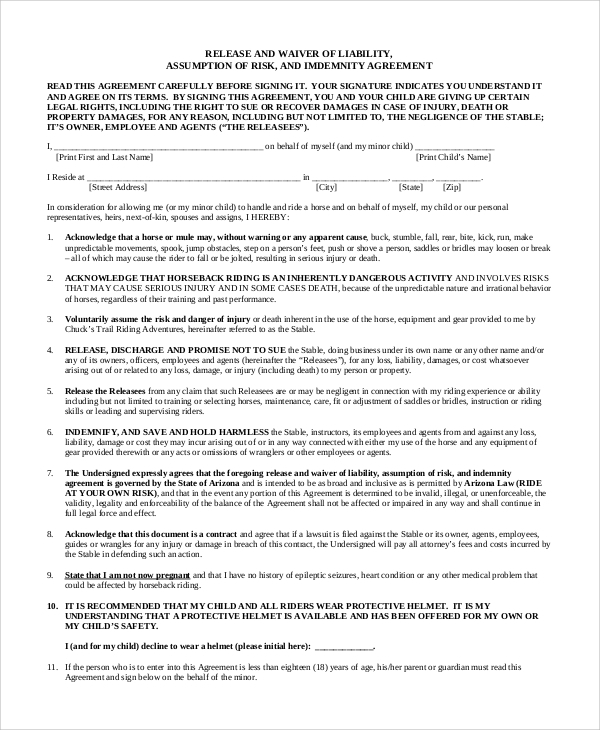 This is a form to certify someone by releasing him from any liability. It is applicable for the workers to get an assurance that their actions will not lead to any consequences as long as they are morally right and within the provisions mentioned by the company. It also assures that the firm does not hold any insurance program for the workers. 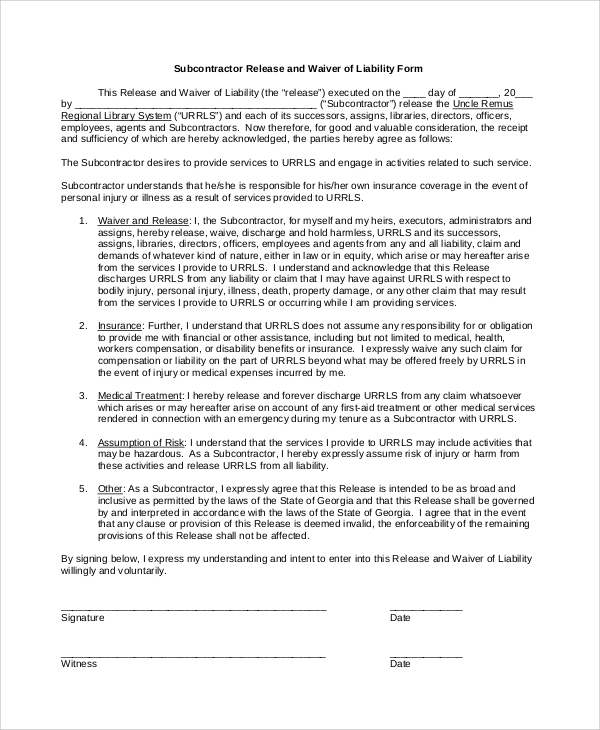 This is a general liability waiver document that is applicable in any workplace. It contains the assumption of all the risks that may arise; it lists all the responsibilities of the worker and the company, and finally, it includes a section to waive the liabilities of all kinds. 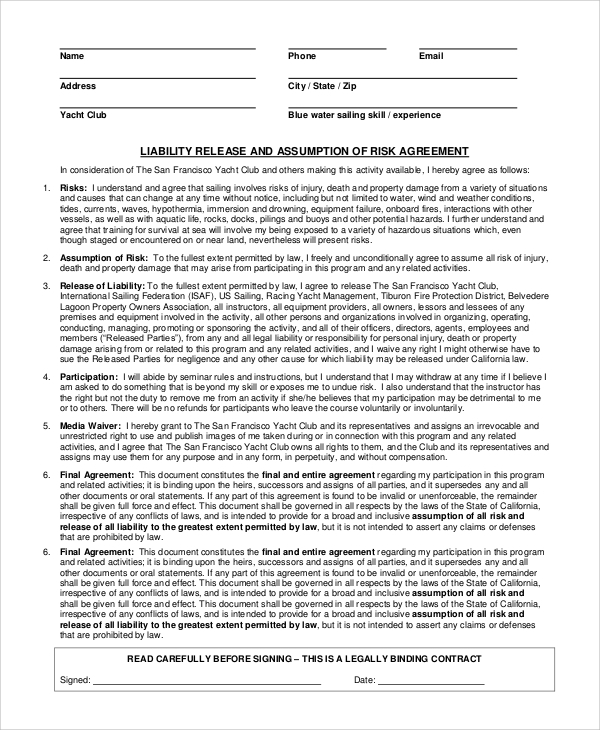 This is a liability waiver document for the sub-contractor to sign for a company to free himself from any liability that may arise during working condition. It is a one-page document, and it includes all the provisions such as medical treatment, risk involvement, and other necessary sections. 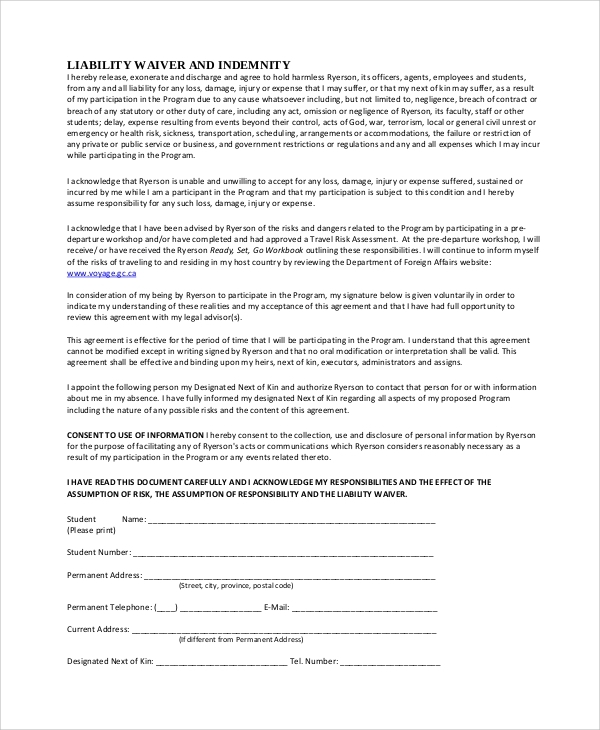 This is a general declaimer for liability waiver for participant’s agreement. It lists the risks which are applicable for a waiver, it states the responsibilities of the company and the participants and when the participants can be declared released of any liability. The Liability Waiver Forms are mandatory to protect the participants from extreme legal cases and monetary fines that the company may face due to his activities. The documents list the risks that may arise, the responsibilities of the participants and the company and that the enterprise will be responsible for all unforeseen circumstances. Different types of jobs require various types of release of liability forms as the risks differ in various field of work and the above-listed forms have multiple samples to work with that covers all the relevant fields and general work as well. 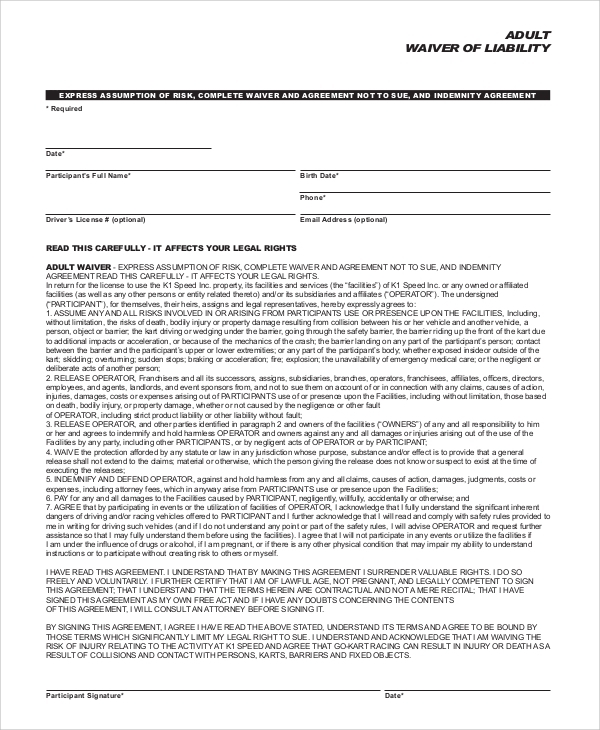 The targeted audiences for the liability waiver forms are the participants such as a contractor, sub-contractor, service providing companies, general employees of a company, and so on who are an integral part of a program or work. It is also applicable for doctors and healthcare centers who make the guardians of the patients sign such forms to avoid legal cases. Such forms are also appropriate for any company to want to clarify the roles and responsibilities of the enterprise in the event of any future legal and monetary fine cases. 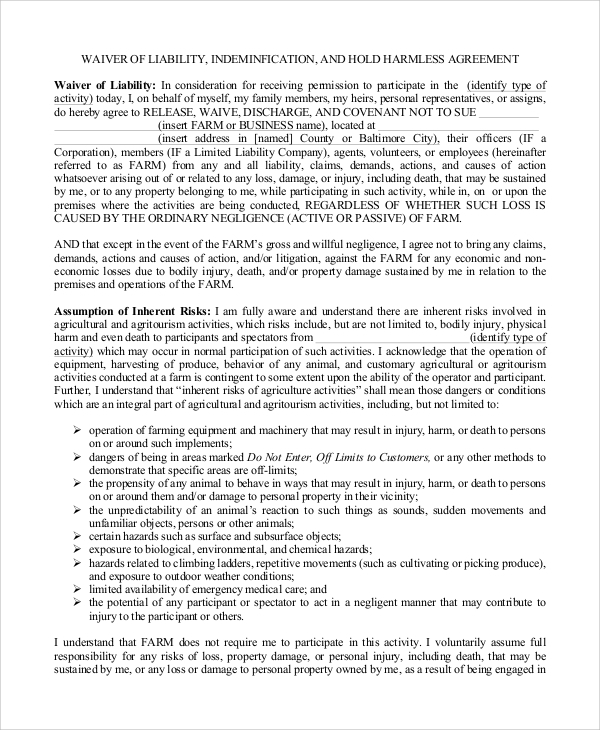 The above-listed liability waiver forms have all the provisions that will protect both the participants and the company for the exploitation of any kind. It also states the risks and responsibilities that the firm won’t be held responsible for and most of them are on the moral ground than technical. There are different types of Sample Release of Liability Forms that are applicable to particular participants.